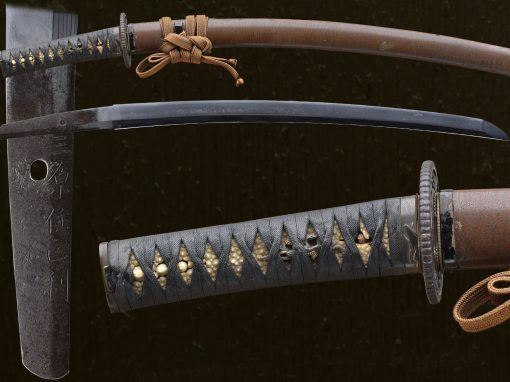 The hamon of this sword is in the gunome/choji style and looks attractive. 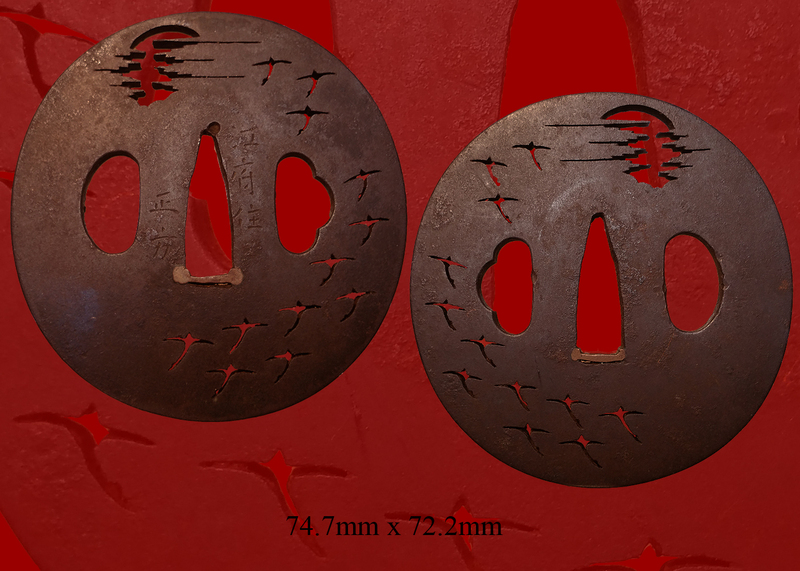 The hada is itame and clear. 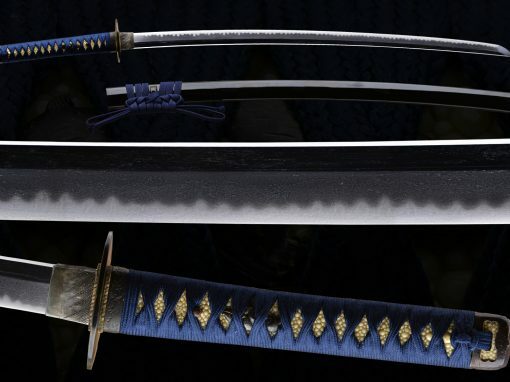 The blade has a partial mei remaining. 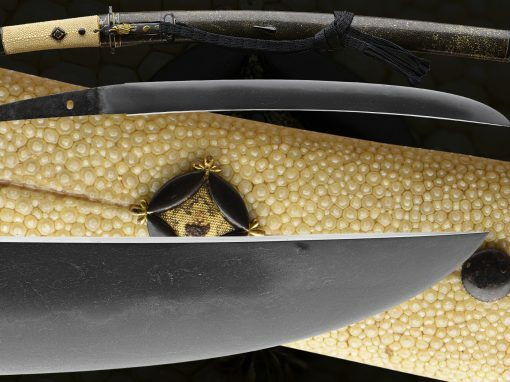 This tanto has a horimono that is partially obscured by the shortening of the blade though most remains. 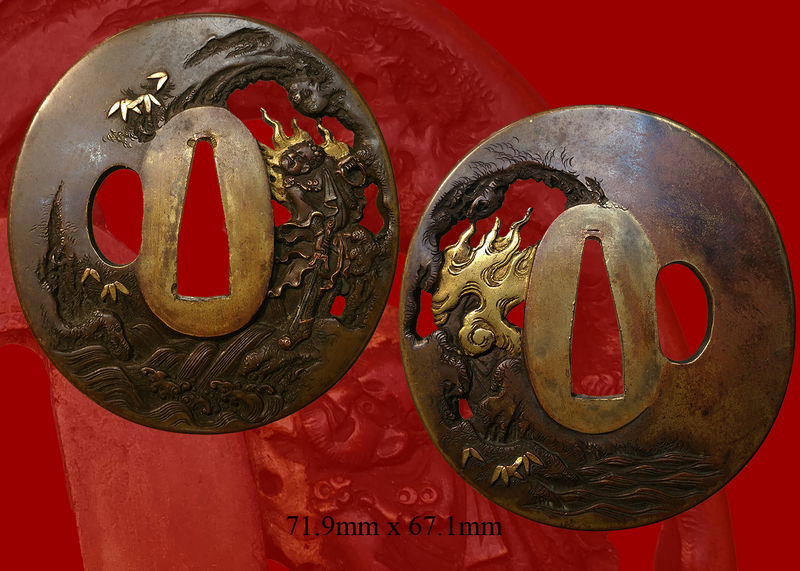 There is a ” SO NO KURIKARA ” which is a dragon winding around a ken. 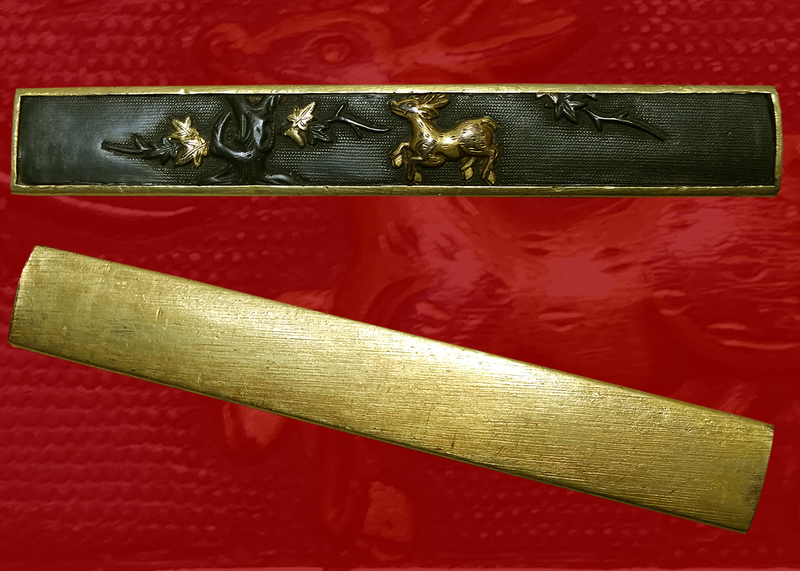 this is a highly simplified dragon which winds around a sword and very visible for such an old blade. 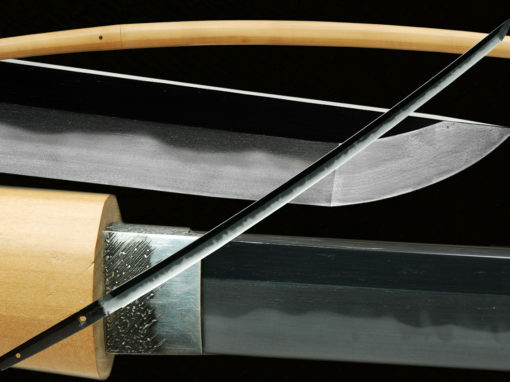 The sword is mounted in shirasaya with an old sayagaki. 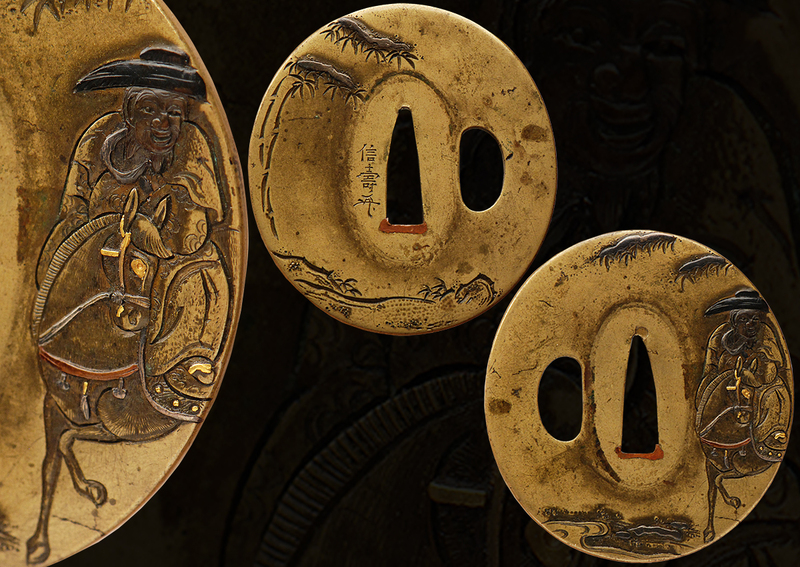 The habaki is very rich looking and gilded in gold. 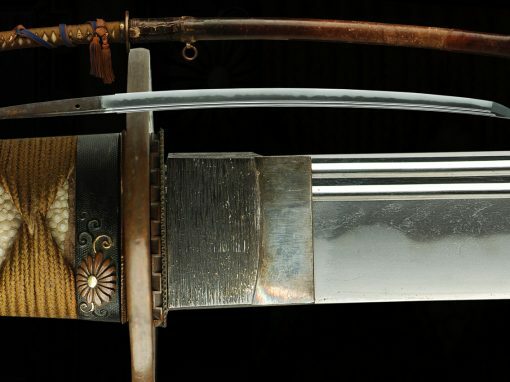 a great old sword that is very reasonably priced. 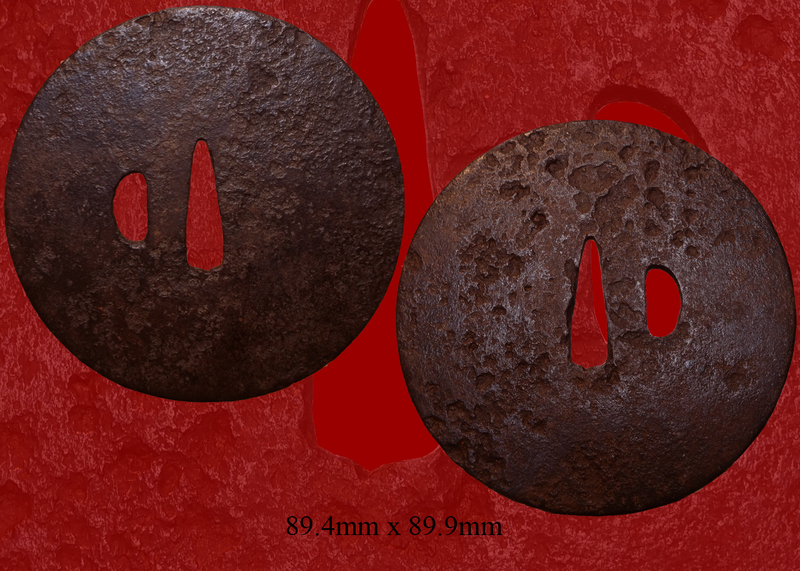 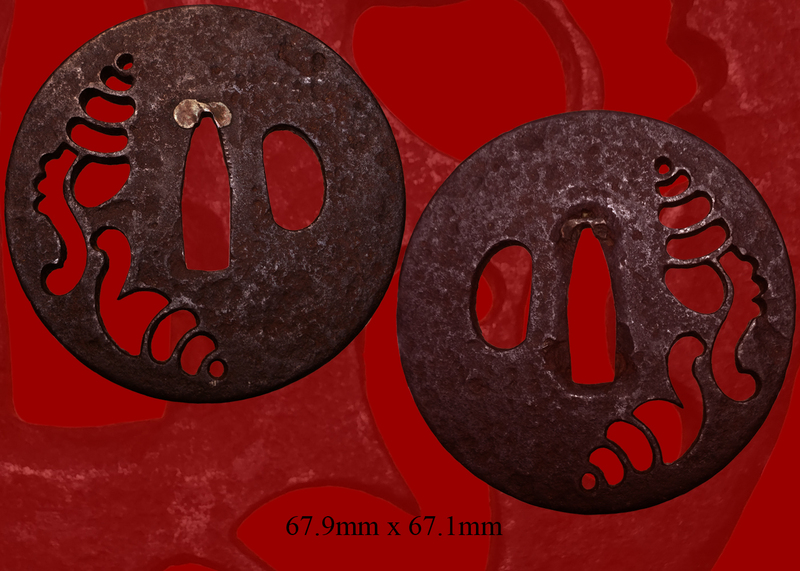 Email us if your interested in this item and remember to include the order number for this item: fss-815. 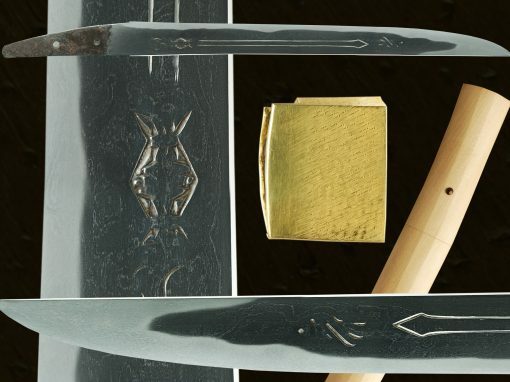 In the Shouou Era some 700 years ago, Regent Hojo called swordsmiths from across the country to the city of Kamakura, then the seat of the shogunate, to set the standards for Kamakura’s swordsmiths. 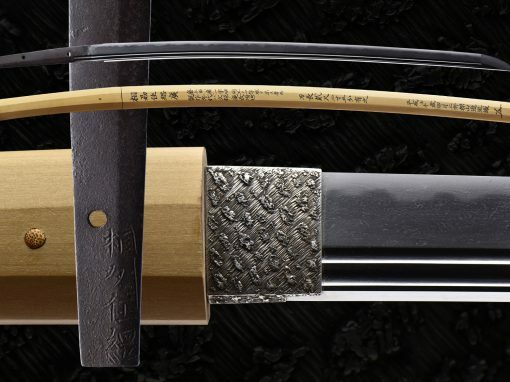 Goro Nyudo Masamune, the founder of the Soshu tradition, was the son of the swordsmith Yukimitsu from Awataguchi, Kyoto. 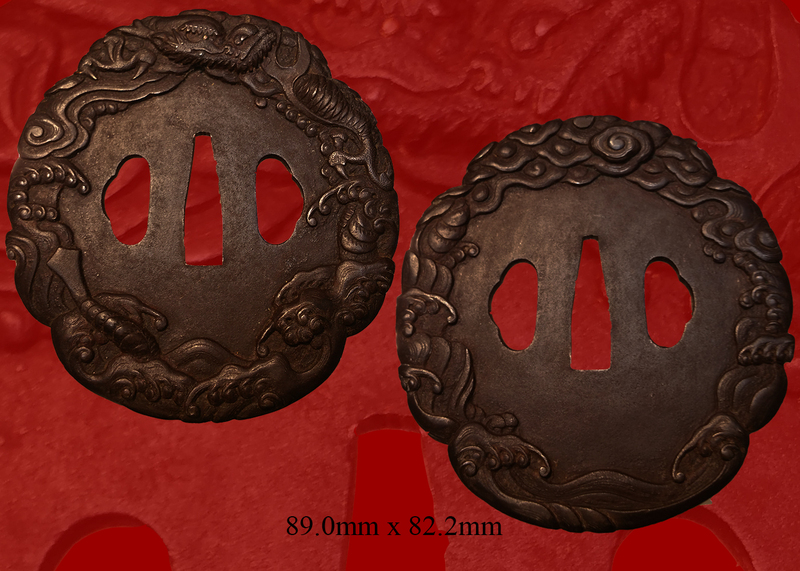 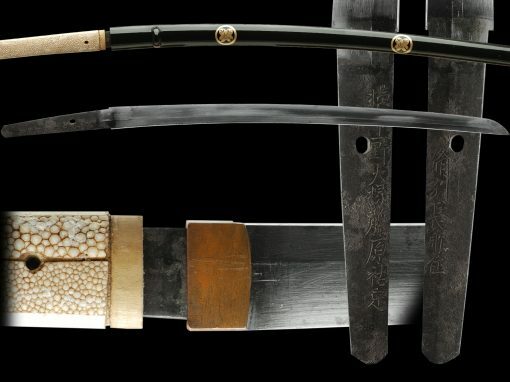 He worked with the traditional standard sword-making styles of the time and improved upon them, leading to the start of the distinctive Soshu style. 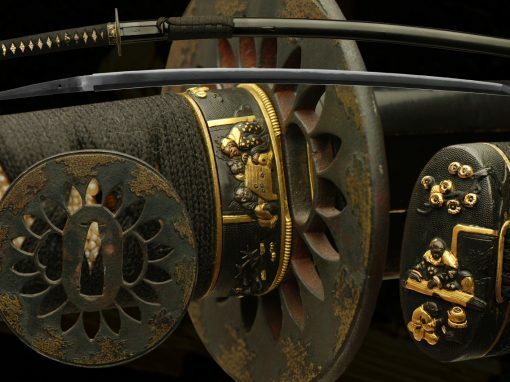 Hiromasa, five generations after the original Masamune, worked for the Odawara Hojo clan. 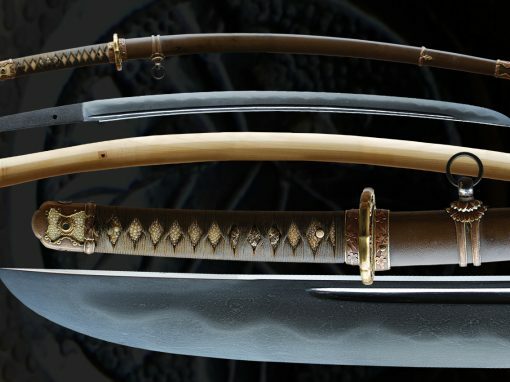 After being bestowed with the “tsuna” from the name of the second-generation Ujitsuna, he took the name Tsunahiro, later flourishing as the preferred swordsmith for the Tokugawa clan. 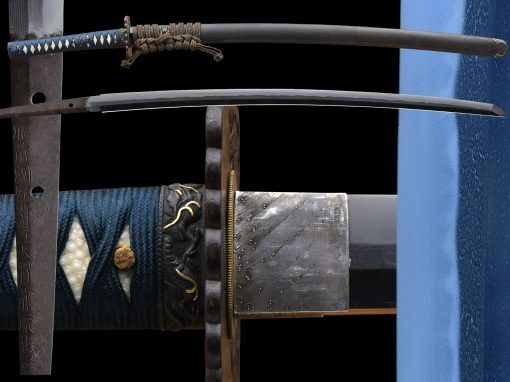 Entering the Muromachi Period, Soshu smiths who were descendants of Masamune, who is one of the greatest smiths in the history, came to lose their brilliance and their forging skill declined. 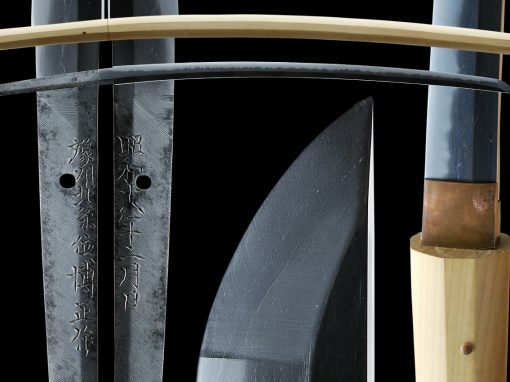 They made tanto and wakizashi with wide mi-haba and saki-zori that had not been seen before. 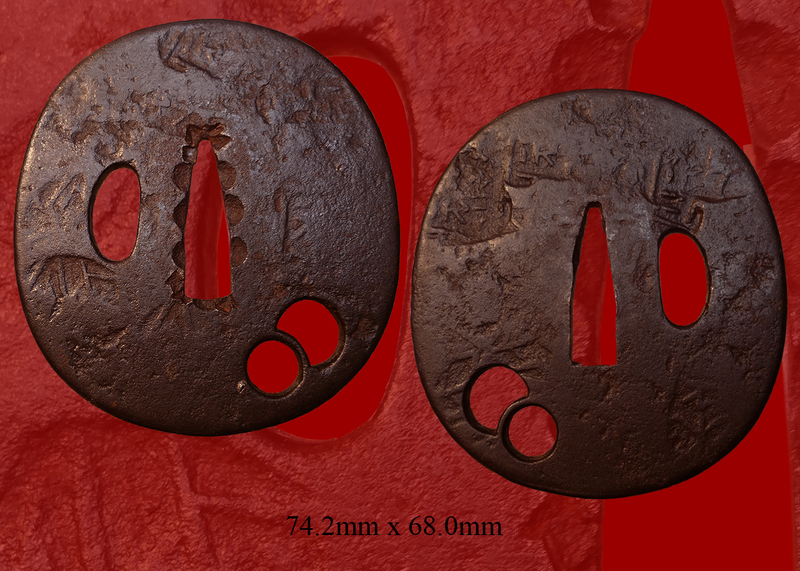 Sue-Soshu smiths temper hitatsura in nioi-deki like Shimada smiths. 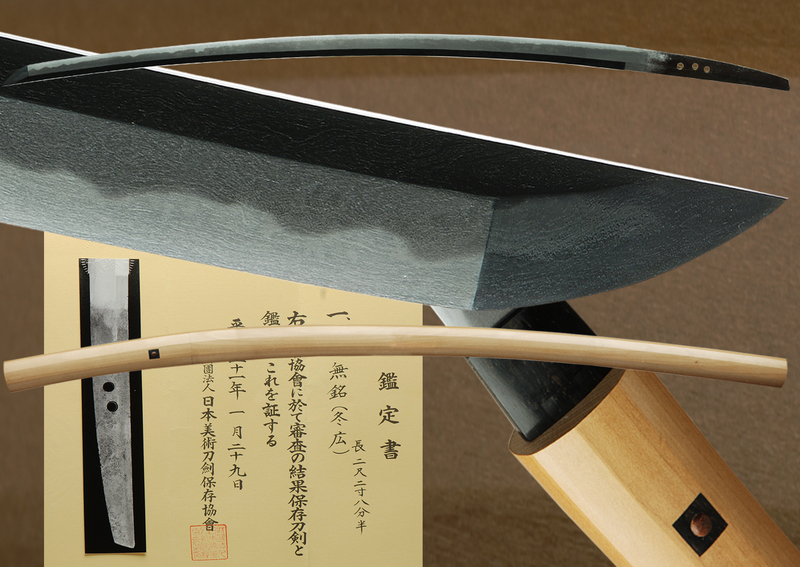 Hamon consisting of brilliant nie by the great Soshu smiths of the Kamakura and Nambokucho Periods are not seen anymore in this period. 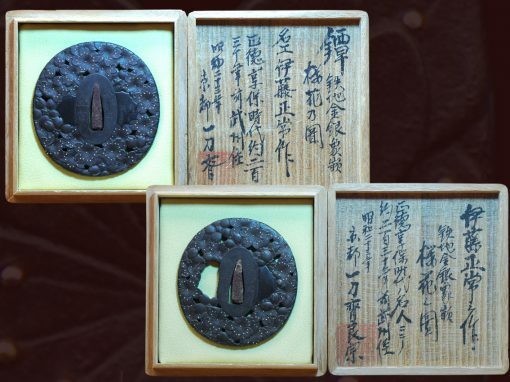 The smith names of Hiromitsu, Akihiro, Masahiro and Hiromasa are succeeded up to in this period. 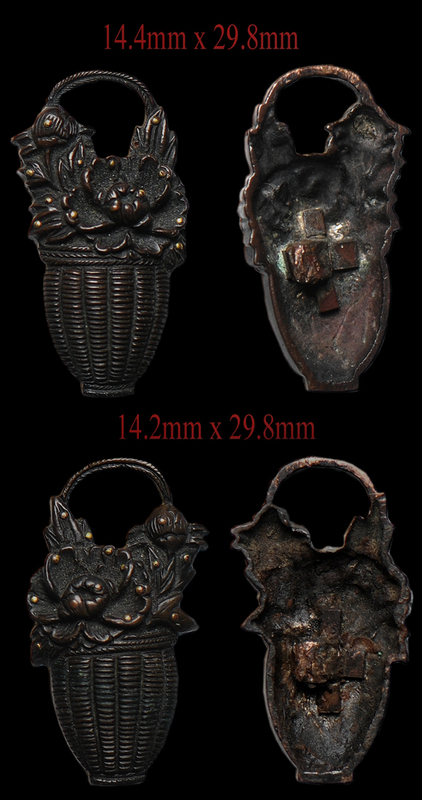 In addition, Hirotsugu, Fuyuhiro, Sukehiro and Takahiro are active in this period. 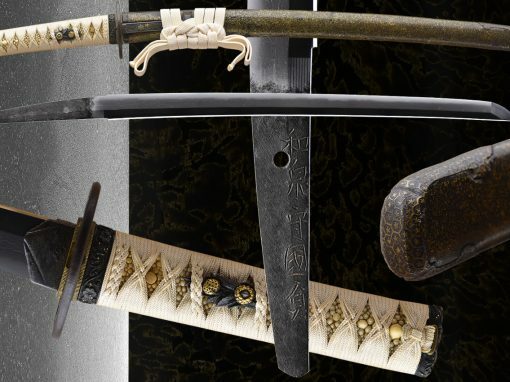 There appear to be a few generations of these smiths except Takahiro. 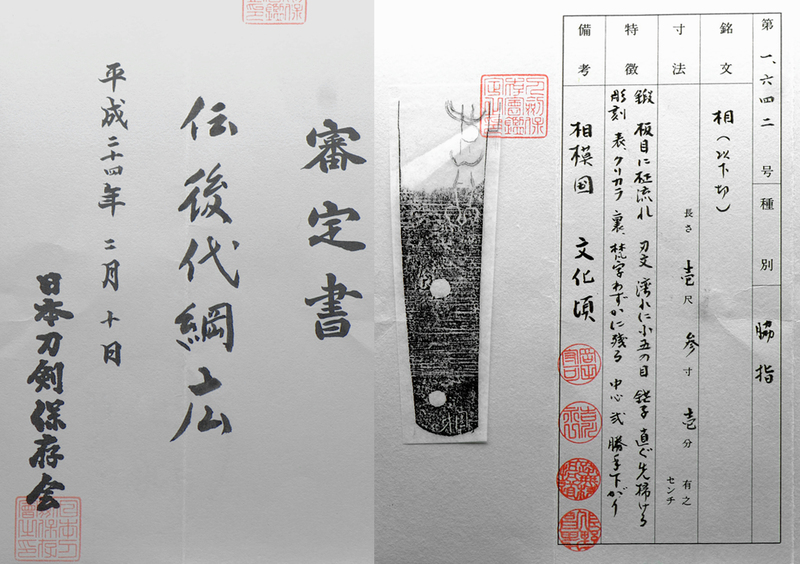 ‘Kokon Mei Zukushi’ says that Hirotsugu and Sukehiro are related to a smith named Yoshihiro who moved from Yamato Province in the late Nambokucho Period, but I think it is too early to confirm their lineage. 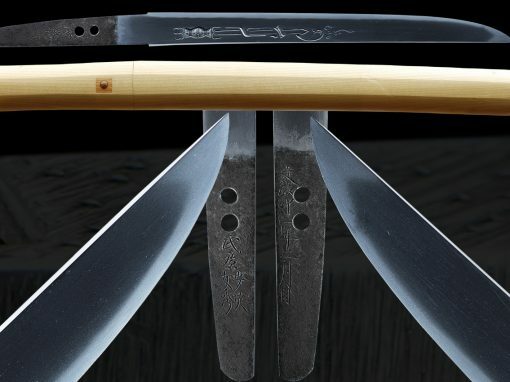 Tsunahiro who is said to have been a student of Tsunaie, who was himself a student of the 1st Shimada Yoshisuke, was a skilful smith amongst them and demonstrates a Soshu-den that reminds one somewhat of the workmanship of old Soshu smiths. 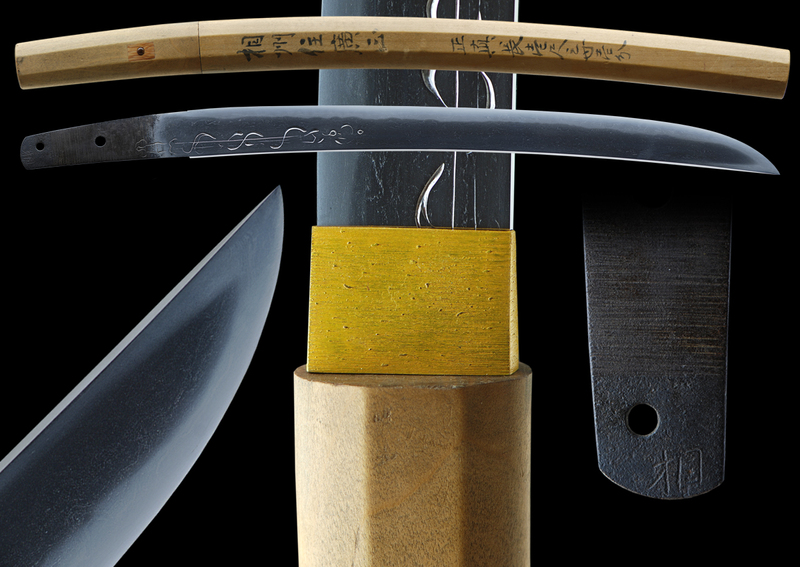 Sue-Soshu smiths liked to carve horimono on their tanto and wakizashi. 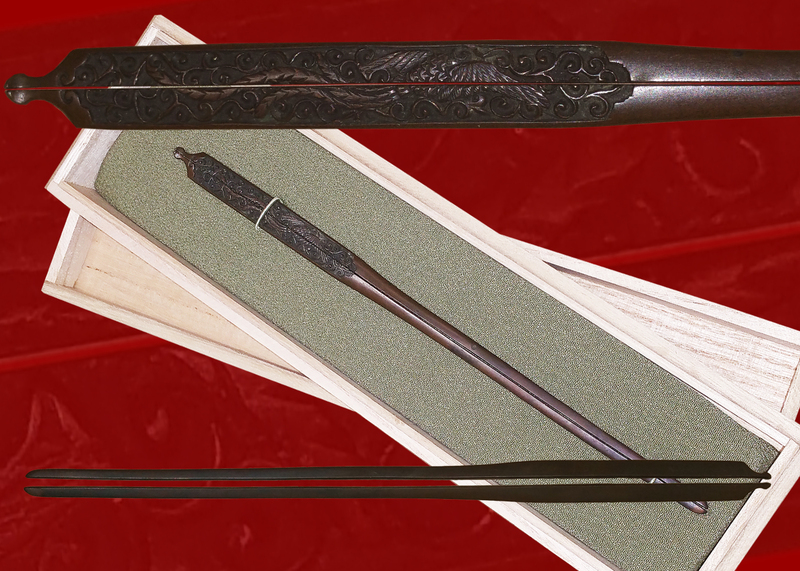 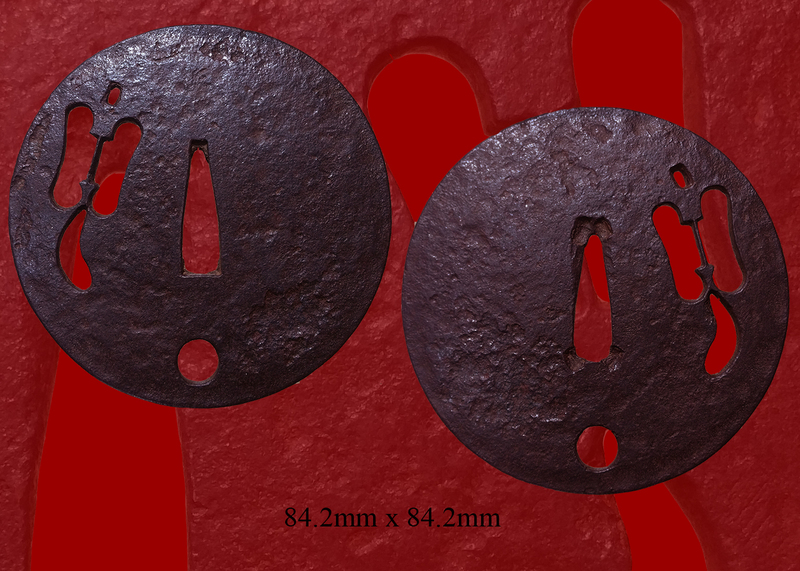 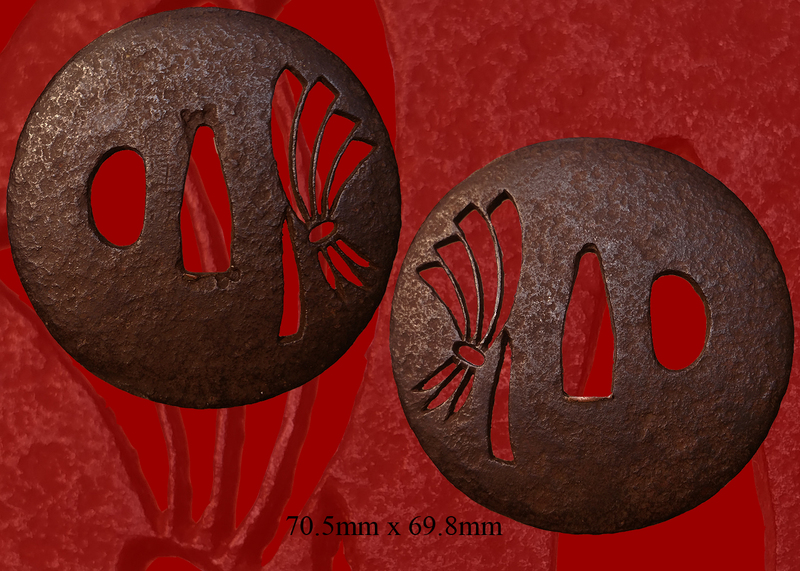 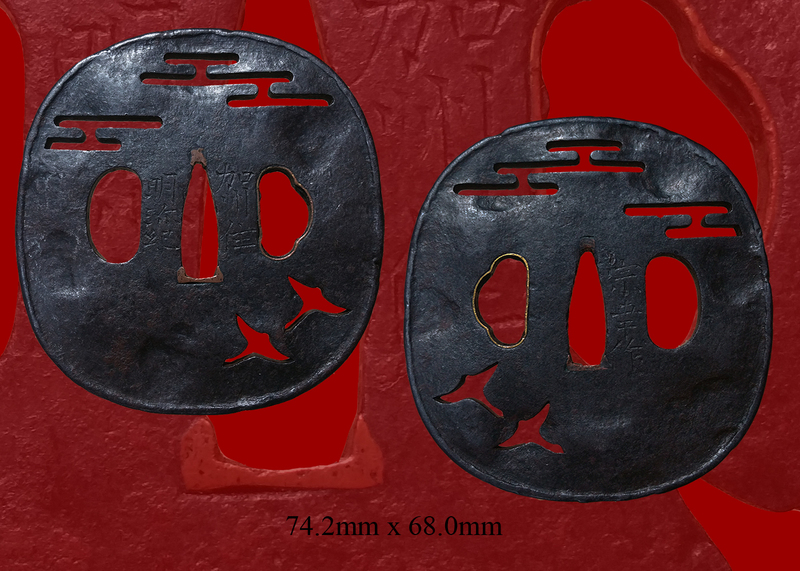 Tsunahiro was the most skilful engraver and the smith name is succeeded up to the Edo Period. 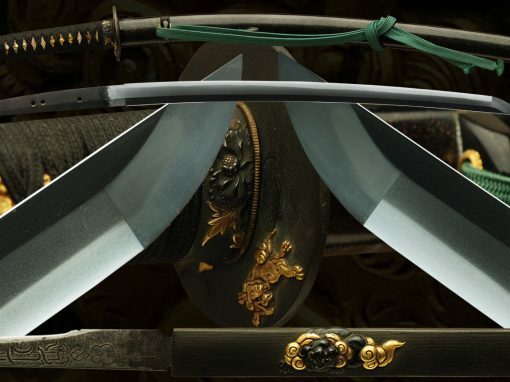 There are three smiths called Yasukuni, Yasuharu and Yasuharu who were active around the same time and are related to the Shimada school. 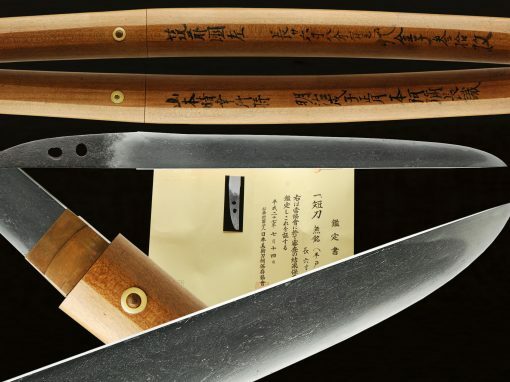 Yasuharu favours to make small tanto with horimono. 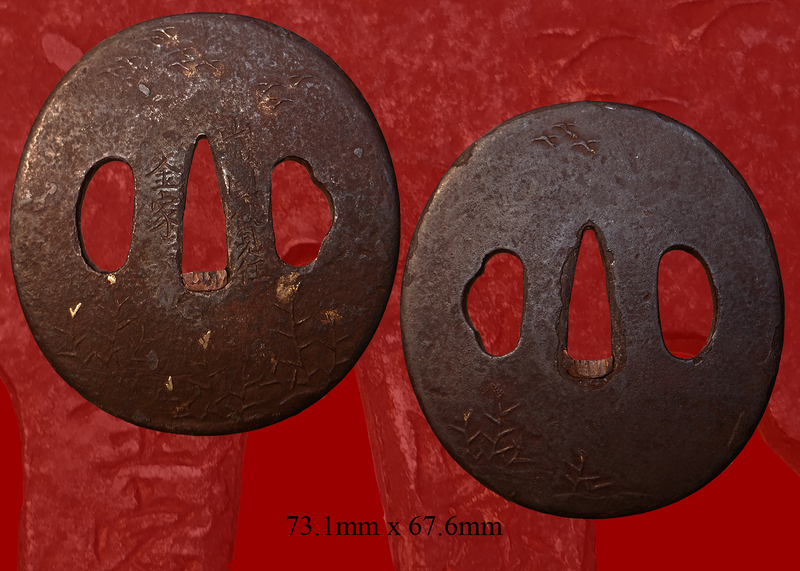 They were retained by the Go-Hojo family and lived in Odawara which was the castle town of the Go-Hojo family, and so were called ‘Odawara-Soshu’. 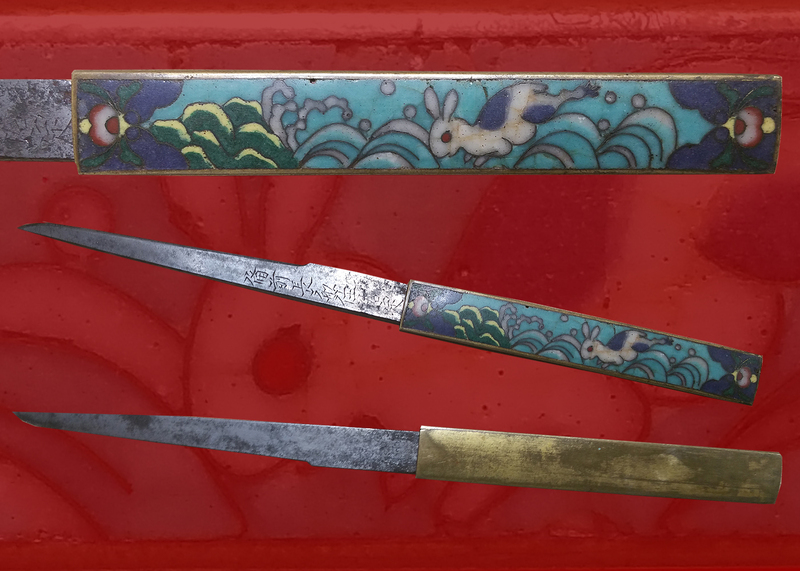 Horimono is often seen on the blades of Sue-Soshu smiths Amongst them, Fusamune was good at elaborate horimono and it is said that he collaborated with Tsunaie. 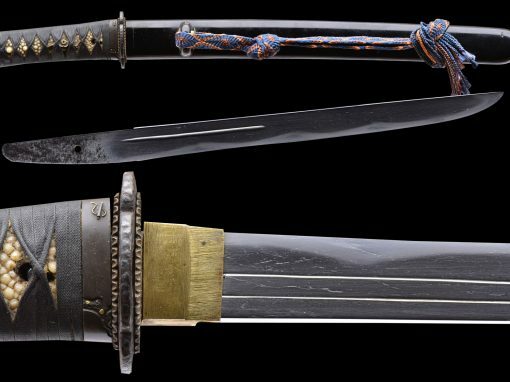 Sue-Soshu smiths normally tempered midare-ba but Kunitsugu who was active around the Eisho Era tempered sugu-ha and also hoso-sugu-ha on his tanto. 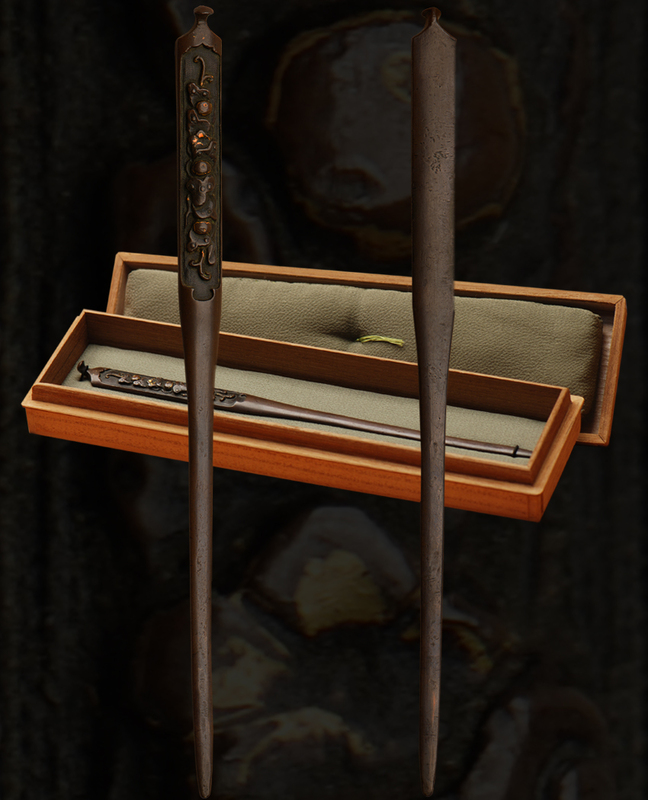 The lineage of Kunitsugu is uncertain.